What better place to get a taste of an important new technology market than SXSW Interactive 2017, this week in Austin. And the fact that this time the new market involves not more quasi-useful apps of one sort or another but nothing less than the lofty goal of improving civic life– the Smart City movement–is a surprise and a breath of fresh air in this year of contentious political dialogue. When most people think about bringing display technology, networking, and data tools to the task of improving the experience of moving through public spaces, airports come to mind– and other kinds of large transportation hubs. And college campuses. And the common areas inside corporate campuses. Stretching the idea of a public space a bit more, retail environments are typically open to the public, and we’ve seen all manor of sophisticated digital signage, kiosks, and interactive tools come into the retail space. And certainly SXSW Interactive has seen the launch of interesting tech tools for shopper or fan engagement. The move of sophisticated AV, IT, interactive and even collaborative technology out from “rooms” and into those kinds of spaces has been a trend for a decade or more. But one of the most exciting new uses for display, messaging, and interactive technology can be seen in the Smart City movement that is gaining rapid traction around the world. The concept behind Smart Cities is straight-forward: the use of technology to help cities become more efficient, secure, and sustainable–while improving the quality of life of its citizens and visitors. UNICEF estimates that 70% of the world’s population will live in cities by 2050. On the business side the market research firm Frost & Sullivan estimates the smart city market will generate $1.5 Trillion dollars by 2020. SXSW Interactive 2017, this week in Austin, featured a pretty deep dive into Smart City trends. Several stand-alone panels featured Smart City themes at SXSW Interactive. 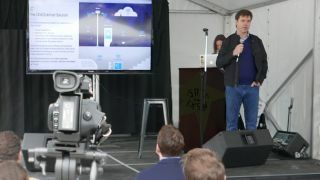 But the all-day event on Sunday March 12th, the SMART CITY DAY @ SXSW, featured a series of lightning talks– from mayors, city technology officers, solution providers, and entrepreneurs who were tasked with showing what they are doing, what works, what is needed, and what is to come for the Smart City. Brad Gleeson explained CIVIQ Smartscape's projects, and working to offer street-level public engagement technology networks to cities around North America and around the world, working with municipalities, public agencies and government-related groups and organizations– a task that is very different than selling to private sector businesses. A long list of experts on both the user and provider sides gave updates on top tech trends–the Internet of Things (IoT), big data, autonomous vehicles, 5G, connected buildings and homes, smart grids, and more. They explained how these initiatives are impacting cities, in terms of mobility, affordability, energy, sustainability, access to healthcare and education, citizen engagement, and the digital divide. This was not your father’s trade conference– with random panel sessions. This was an incredibly deep roster of dozens of experts– too many to list here– from around the country and the world. On the mayoral front, Mayor Michael B. Hancock, the mayor of Denver, CO, and Mayor Joel Robideaux, mayor of Lafayette, LA, offered their perspectives fighting for smart technology adoption on a variety of political and financial fronts. And with a particularly keen message in that vein, Sir Richard Leese, City Councilman of Manchester, England, shared how Manchester–the birthplace of nothing less than the industrial revolution– has “moved from smokestacks to a 21st century city”. (Indeed, Birmingham, known to most Americans as the home of the Manchester United football club, saw the first use of a steam combine, in the late 18th century.) Leese explained that Manchester is the fastest growing city in the UK, and one of the top technology centers in Europe, and is pressing that case farther with technology initiatives on many fronts. Heavyweights on the city administration side– with a tech bent– were Archana Vemulapalli, Chief Technology Officer, Washington, DC, Kerry O’Connor, Chief Innovation Officer, City of Austin, and Lauren Riga, City of Indianapolis Department of Metropolitan Development. And in non-profit city/industry space, Jay Boisseau, President, Austin CityUP, Barbary Brunner, CEO, Austin Technology Council, Jessie Feller Hahn, Executive Director, Meeting of the Minds, and Skip Newberry, President and CEO, Technology Association of Oregon were among the presenters who showed how government/industry cooperation is playing out in good ways to advance the Smart City. Of particular interest to our readers: on the agenda at the SMART CITY DAY @ SXSW, was Brad Gleeson, Chief Commercial Officer, CIVIQ Smartscapes. Gleeson has been a pioneer in the larger DOOH, and AV communities–having captained several prominent companies that have provided digital displays and digital signage and interactive technologies for many kinds of applications. Gleeson now heads up CIVIQ Smartscapes, that works to offer street-level public engagement technology networks to cities around North America and around the world, working with municipalities, public agencies and government-related groups and organizations– a task that is very different than selling to private sector businesses. Gleeson explained at SXSW that cities often need a revenue-neutral solution, for example a public display and wayfinding network around a city’ public transportation system, where the DOOH ads pay for system. He also emphasized that the information stations on a public transportation– including wifi shelters with interactive kiosks– don’t just push out information although that alone would justify the effort. They also act as data-gathering nodes that the city can use to plan many things including traffic management, development, and the provision of city services. This is not about gathering private data from transit users. It’s about gathering aggregate data about traffic and use patterns, and many kinds of data that a city can use not to “target” individuals with products as in a retail environment but to plan city services. An example of a great Smart City project that Gleeson’s CIVIQ Smartscapes is involved with, is the LinkNYC project – where CIVIQ and their partners in the CityBridge consortium, Qualcomm and Intersection – are replacing up to 10,000 public payphone booths with a state-of-the-art communications structure. LinkNYC is completely funded by the CityBridge partners based on advertising revenue generated by the high-brightness LCD displays on each side of the Link structure. Besides paying for the free services this network will provide – from free phone calls, wayfinding maps, city 311 service, emergency 911 service, gigabit free Wi-Fi and mobile device charging – it’s estimated the network will deliver $500M in revenue back to the city over the 10+ year life of the franchise. The enthusiasm for the concept of using technology to help cities become more efficient and “smarter” was demonstrated by the recent Department of Transportation Smart City Challenge that was announced in September of 2015, and resulted in the recent award of $50M to the city of Columbus OH, (matched by an additional $80M in private funds).